Grace tennis player, Daniel Sanchez, has been honored as an NAIA All American. Following an outstanding senior campaign, Grace men’s tennis senior Daniel Sanchez has been honored as an NAIA All-American. 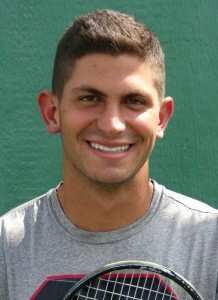 Sanchez was one of three Crossroads League players to earn a spot on the honorable mention list for NAIA All-American. The Puerto Ordaz, Venezuela, native was Grace’s No. 1 singles and No. 1 doubles player all season. He posted a sterling 9-1 mark in singles play and was also 9-1 in doubles alongside Jose Marval. Sanchez was also honored for his academic prowess. He joined teammates Ricardo Bedon and Ethan Grove as Daktronics-NAIA Scholar-Athletes. To receive Scholar-Athlete status, a student must maintain a GPA of at least 3.5 and have reached junior or senior academic status. Grace’s three NAIA Scholar-Athletes were tied for the most in the Crossroads League. The Lancers finished the 2015 season with a 7-3 record in the fall, including 6-2 in league play. Grace has claimed a share of the Crossroads League championship in two of the past three years under head coach Larry Schuh.